SAS Zoning must be enabled in Oracle ILOM prior to performing this Quick Setup procedure for assigning zoning. For instructions, see Access and Enable Sun Blade Zone Manager . To access the Sun Blade Zone Manager Settings page in the web interface, click System Management > SAS Zoning. In the Sun Blade Zone Manager section, click the Quick Setup button. To overwrite existing zoning assignments, click OK. The Quick Setup screen appears. Note - Any HDD chassis slot that does not have a HDD presently installed in the chassis is labeled “empty.” Empty HDD chassis slots are not included in the Quick Setup storage assignments. To indicate how you would like to allocate the chassis storage resources, select one of the Quick Setup options. For a description of each Quick Setup option, see Whole Chassis Setup: Quick Setup. 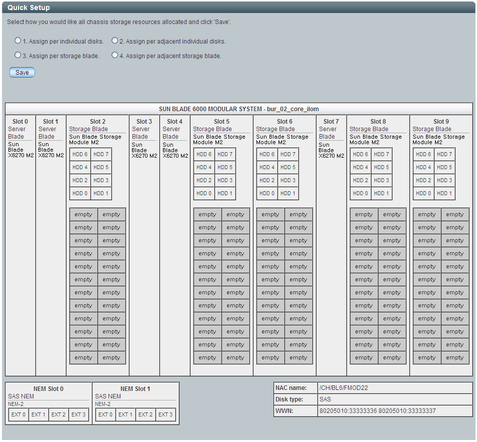 After choosing a Quick Setup option, the Sun Blade Zone Manager displays the color-coded zoning allocations between the CPU blade servers and storage devices (HDDs) installed on the storage blade servers. Although the Sun Blade Zone Manager shows the NEM0 and NEM1 External SAS connections, these connections are not supported. Note - Until you click the Save button, the chassis storage allocations are not saved. To save the Quick Setup chassis storage allocations, click Save.